Ever since the weather got cooler and it wasn’t INSANE to turn on the oven, I’ve been roasting a lot of stuff. I mostly roast big chunks of meat but lately I have found much join in roasting veggies. In the past, whenever I roast veggies it’s usually carrots or potatoes, as a side dish. But ever since I had a pasta dish at Allswell that had roasted red cabbage, I was hooked. So now, every Sunday I would walk down to the Park Slope Farmers Market, pick up some veggies and roast them. It’s quick (well 30mins or so), easy and mighty delicious. I have put together a small list of veggies everyone should try roasting. 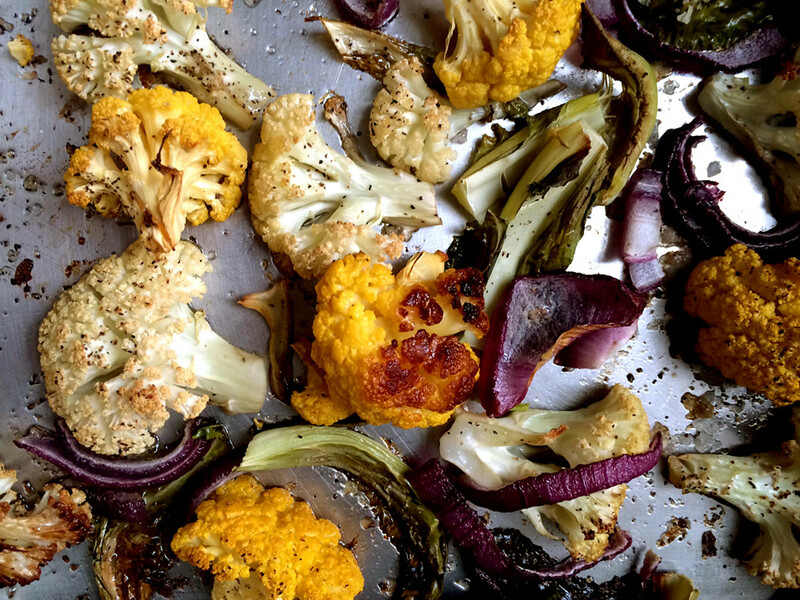 Can I call Fall 2013 the season of cauliflower? At least for me. I have eaten soooo much cauliflower lately and I’m not even bored with it yet. I got the idea to roast cauliflowers when I saw the post over at Spoon Fork Bacon for a vegan cauliflower cream sauce. – In a 375 degree oven, roast the cauliflower and sliced red onion (with a nice coating of olive oil, salt and pepper) for about 30 to 40mins or when the individual florets are fork tender. Mix in pasta and done. I have always used red cabbage in soups, I never thought of roasting them till I had it at Allswell. – Slice the cabbage into inch thick slices and give them a good coating of olive oil. Put them on a tray and season them. For kicks, I added baby bell peppers and garlic. 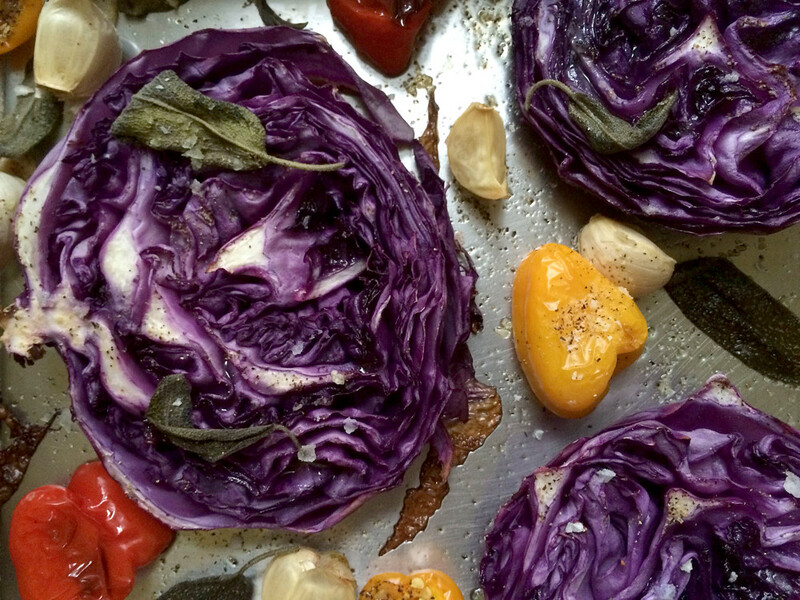 In a 400 degree oven, roast them for about 25 to 35mins or when the cabbage is soft. When they’re done, slice everything up and toss in pasta or I bet they go great with some fried chicken or duck confit. (Picture above) I don’t remember why or how I decided to roast avocados but along the way I did find a cool way of cutting avocados. Avocado rings! I made a lovely warm salad of roasted Brussels sprouts and avocado rings with a generous amount of hot sauce and parmesan cheese. I also took couple avocado rings and jammed it into a sandwich with scrambled eggs. – First, beat an egg white until it is frothy. Dip all the sliced up Brussels sprouts and avocado rings into the egg white (the egg white will make everything extra crispy). Make sure every piece is coated nicely. Lay the pieces onto a baking sheet and season. Stick it in a 400 degree oven for 20 to 30mins. 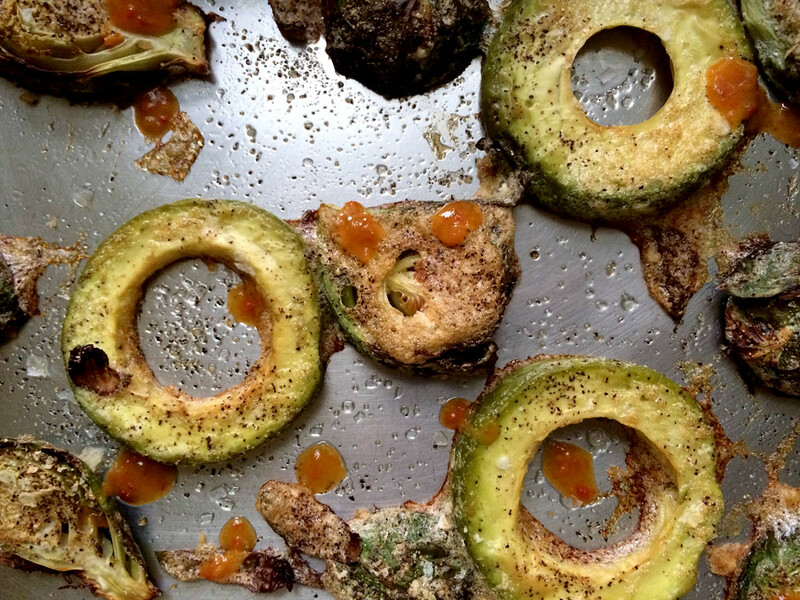 i’m all for roasting most veggies, but i’m not a fan of cooked avocado. i tried making those cool little egg avocado cup thingies that get pinned to death and while they look really beautiful they don’t really work in practice. However, i can always go for a refreshing avocado milk shake!